Is there any way to predict which lights-out relievers will become dominant starters? The Texas Rangers had high hopes for C.J. Wilson when they converted him from relief work to the starting rotation after the 2009 season. In Wilson, the Rangers saw a pitcher who had a chance to parlay 70 innings of success in the pen into 200 effective innings as a starter. Three pitches into his first start of 2010, his first start at any level in five years, Wilson ceded a single to light-hitting utilityman Mike McCoy. It was only one batter, of course. But Wilson had been a disaster as a starter in 2005, yielding a ludicrous 31 runs in 21⅔ innings. Converting a reliever to the rotation is an exercise fraught with fear and uncertainty, and the Rangers might’ve turned their lights-out setup man into an arsonist who would burn Texas’s staff, and its season, to the ground. Four pitches later, Wilson got Jose Bautista to tap into a double play. Wilson would go on to fire seven shutout innings, whiffing nine batters and allowing just seven baserunners. He’d make 32 more starts that year, emerging as a front-line starter and leading the Rangers to their first AL pennant in franchise history. The following year, he became a full-blown ace, guiding Texas to another AL crown. The Great C.J. Wilson Experiment proved to be one of the best gambles made by any team in the past decade. The Rangers promoted hard-throwing reliever Alexi Ogando to the rotation in 2011 and reaped similarly excellent results. But Texas’s two-time success belies the challenges of successfully ushering a reliever into a starter’s role. When talented young pitchers Daniel Bard, Chris Sale, Aaron Crow, Neftali Feliz, and Phil Hughes1 attempt the switch this season, they’ll face precedents ranging from Wilson’s huge success to failures nearly as spectacular. ESPN Stats & Information found 12 major league pitchers who pitched exclusively (or nearly exclusively) in relief for at least two years straight, then made at least 20 starts in relief in year one as a starter. Aside from the very small sample size, the list suffers from a bit of selection bias, since teams are more likely to give 20-plus starts to a pitcher who’s at least holding his own. Plus, teams are more likely to convert pitchers they deem most likely to succeed as starters, based on a combination of physical and mental factors. Either way, the results are decidedly mixed. Seven pitchers fared better in their first year after switching to the rotation (going by Fielding Independent Pitching), while five pitchers fared worse. Even Wilson, who produced more than 10 Wins Above Replacement in his two years in the Rangers rotation after converting from relief, still yielded more runs as a starter, whether on an absolute or fielding-independent basis. ESPN’s Dan Szymborski did a more thorough study in 2003, looking at dozens of pitchers dating back to 1920 who went from the bullpen to starting roles. He supplemented that data by including all the established starters who shifted to relief during that time. Szymborski found that relievers making either transition posted an aggregate ERA of 3.46; starters’ ERA came in nearly a full run higher, at 4.31. Relievers also struck out more batters (7.5 K/9 IP for RP vs. 6.6 K/9 IP for SP) and allowed fewer home runs (0.8 HR/9 IP for RP vs. 1.0 HR/9 IP for SP) than their rotation counterparts.2 Baseball researcher Tom Tango studied all pitchers from 1993 to 2008 who pitched as both starters and relievers and found similar results: a .352 weighted On-Base Average allowed by starters, versus .329 for relievers. In that study, starters allowed about one more run per nine innings than relievers did. That modern-day relievers show significantly better results than starters is no surprise. As much hype and awesome psych-up music as bullpen stoppers get when they enter the game, even the biggest closerphiles would concede that it’s tougher to throw 100 great pitches than 15, tougher to mow down hitters for eight innings than it is for one. The most dominant, record-setting relief pitchers of the modern era — Eric Gagne, Trevor Hoffman, Mariano Rivera — all converted to relief because their teams didn’t think they could hack it as starters. The key, then, is identifying those pitchers who can buck the prevailing trend and dominate as starters the way they have as relievers. Maybe even get better. The Tigers thought they had a worthy switch candidate last season in Phil Coke. The lefty came up as a starter in the Yankees system before converting to relief, then went to Detroit in the three-team Curtis Granderson deal. Pitchers often gain a couple ticks on their fastballs upon converting to relief (and lose a couple the other way) since they can let loose much easier for a few batters than they can going through a lineup three times, and Coke’s low-to-mid-90s velocity gave him some wiggle room if his heat regressed. He also had what Wilson had when he made the switch: The ability to throw three or more pitches for strikes, a must for just about any starter not named Randy Johnson. “He had the variety of quality stuff, he’d done it before and been successful in the minor leagues,” said Tigers pitching coach Jeff Jones. Though Coke may have looked like a good candidate on paper, he faltered as a starter, walking nearly as many batters as he struck out. Converted back to relief at mid-season, he shaved more than a run off his ERA as a reliever and hiked his strikeout-to-walk rate above three-to-one. One of Coke’s biggest struggles was an inability to pitch deep into games, as he lasted just 5.3 innings per start. Whether that was due to Coke’s failure to mentally adjust to his new/old role or a lack of physical stamina is tough to say. The book on relief pitchers, especially late-inning setup men and closers, is that they’re cut from a different cloth than most other players. They glare in at hitters, reach back for every last ounce of heat, and throw each pitch like it’s their last. But Rangers pitching coach Mike Maddux says the key to successful bullpen-to-rotation moves is to carry that “fire-breathing attitude” into the new gig. “Look at the contracts that have been signed the past couple years,” said Maddux. “Cliff Lee was the top starter on the market, and he got $120 million. Papelbon was the top reliever, and he got $50 million. So your economics would tell you if you’re sitting on a no. 1 starter, why not use him before you have to pay him $120 million?” With Lee and Wilson leaving these past two offseasons, Feliz (and Yu Darvish) must now pick up the slack in the rotation if the Rangers intend to hold off the Angels in the AL West and get back to the World Series. these are some of the biggest questions the Red Sox must answer as they try to return to the postseason after last year’s spectacular collapse. White Sox lefty Chris Sale and Royals right-hander Aaron Crow face less immediate pressure as they make the leap to starting on likely non-contending teams. 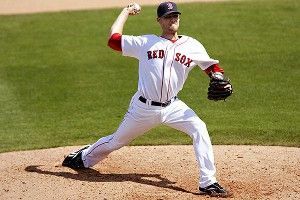 But long-term, both clubs will need production from those young pitchers as they try to rebuild. Meanwhile, Phil Hughes might jump back into the Yankees rotation, one year removed from an 18-win season not entirely supported by peripherals (4.25 FIP, 1.3 HR/9 IP). Like Feliz and Bard, Sale, Crow, and Hughes also throw hard enough to have rotation-worthy fastballs, even if they do lose a couple mph from their let-‘er-rip bullpen roles. But Sale has never started in pro ball, after dominating as a starter at Florida Gulf Coast University; Crow showed major command issues after a hot start last season (5.3 walks per nine innings in the second half); and Hughes has shown flashes of potential as a starter, but never enough for the Yankees to simply leave him in the rotation. For all of these pitchers, it would be great to apply science and predict the likely winners and losers. But if teams could predict with any degree of accuracy how these transitions would go, you’d see them a lot more often. We’re cheating a little with Hughes: He’s been a starter in more than one major league season but his injury-plagued 2011 season pushed him to the pen, despite initially starting the season in the rotation. Starters have the luxury of running long distances between appearances, knowing their bodies have time to recover. A reliever who tries to bang out a five-mile morning run might be in for a world of pain if his number gets called that night.